Present-day automated hematology analyzers provide a more accurate, direct measure of MCV, based on the actual volume of the cell as it passes through a laser (laser-based hematologic analyzers) or an electronic beam (“impedance” methods). 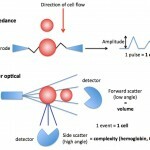 The amount of laser light scattered in a forward direction or the amplitude of pulses created in the electronic field as the cells through the detector is equivalent to the cell volume, which is averaged based on the number of cells analyzed by the instrument. The instruments also “channelize” the scatter or impulses, segregating them into channels representing relative ranges of cell volume. This is illustrated as a frequency distribution curve or histogram (see image below). 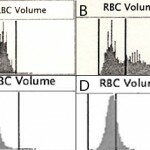 The variation in RBC volume provides the measurement, the red blood cell distribution width (which equals the coefficient of variation of the RBC volume or the standard deviation of RBC volume ÷ MCV). Red blood cell populations with the MCV above the reference interval are termed macrocytic. Conversely, red blood cell populations with the MCV below the reference interval are termed microcytic. The RBC in a blood smear may not be obviously macrocytic or microcytic, particularly if all RBC are affected by the change. Red cell clumping or agglutination: With impedance-based analyzers, agglutinated RBC are detected as single large cells, resulting in very high MCVs (> 90 FL) and low MCHCs. This occurs rarely with the laser-based analyzers, such as the hematology analyzer we use at Cornell, since the agglutinated clumps are excluded from the analysis (which may decrease the RBC count but does not affect the MCV as much). Storage-related changes: Red blood cells swell with storage, increasing the MCV and decreasing MCHC. This will occur quite rapidly, within 24 hours of collection particularly if the blood sample is not kept cool until analysis. Hyperosmolality: With the ADVIA hematology analyzer (and potentially other hematologic analyzers), macrocytosis can be observed in animals with severe hyperosmolality, e.g. hypernatremia. This is attributed to dehydration of red blood cells which occurs in vivo due to the hyperosmotic environment. Once these dehydrated cells are placed in an iso-osmolar diluent for counting within the analyzer, they are now actually hypertonic compared to the diluent and swell in vitro in the iso-osmolar diluent, thus increasing the MCV and decreasing the MCHC. So the swelling of RBCs occurs in the machine and not in the animal. Breed: Breed-associated macrocytosis has been reported in Greyhounds (around 81 fL, although this has recently been refuted (Zaldivar-Lopez et al., 2011) and Miniature and Toy Poodles (up to 90 fL), without any evidence of anemia. Fetal RBC: Fetal RBC are macrocytic. These are generally rapidly removed after birth (phagocytized by macrophages) but some species, e.g. foals, can be macrocytic immediately after birth. Regenerative anemia: Since young red blood cells are usually larger, the MCV can be increased above reference intervals (and the MCHC decreased). These findings are less apparent with laser-based hematology analyzers. Cats that have recovered from a recent anemia can be macrocytic, since punctate reticulocytes (which are frequently larger than normal red blood cells) can persist for up to 3 weeks in the circulation. This is called a post-regenerative macrocytosis. Hereditary stomatocytosis: This inherited defect has been reported in Alaskan, Malamutes, Miniature Schnauzers, Pomeranians, Drentsche Patrijshond and other breeds. There are breed-specific membrane defects in lipid content or the sodium/potassium pump, resulting in macrocytic and hypochromic red blood cells. Affected animals may not be anemic. Primary myelodysplasia or myelodysplastic syndrome: This is a clonal (neoplastic) disorder, that in cats, is usually caused by feline leukemia virus infection. This virus intercalates with DNA, causing abnormal (delayed) nuclear maturation. Folate or vitamin B12 deficiency: Both are required for DNA synthesis (thymidine and nucleoproteins). Impaired DNA synthesis delays cell division resulting in macrocytosis. These deficiencies can occur with intestinal disorders and small intestinal bacterial overgrowth (although macrocytosis is not a feature of these diseases in dogs), drugs which inhibit folate/vitamn B12 absorption or metabolism (e.g. trimethoprim sulphur, hydroxyurea) or because of other mineral deficiencies or excess, such as cobalt deficiency (primary or secondary to molybdenum excess) in ruminants. Cobalt is essential in the molecular structure of vitamin B12. Inherited abnormalities in erythropoiesis: Congenital dyserythropoietic anemia (CDA) is an inherited defect in humans that results in macrocytosis. This has been reported in Polled Hereford cattle and is likely the cause of macrocytosis in Poodles (despite the lack of anemia). Unknown mechanism or miscellaneous: Hyperthyroidism has been associated with macrocytosis in cats in some studies. This was attributed to thyroid hormone induced red blood cell production, with decreased maturation time and premature release of larger red blood cells. Similarly diabetes mellitus has been associated with increased MCV, but this may be a consequence of RBC swelling from osmolality changes. Most dogs and cats with hyperthyroidism or diabetes mellitus are not macrocytic. Hyponatremia: A falsely low MCV is an artifact of ADVIA (and potentially other) analyzers, that is caused by a hypoosmolar environment in vivo, e.g. hyponatremia, to which erythrocytes adjust by increasing cytoplasmic water content. When put in a diluent prior to counting in the machine in vitro, osmosis results in water loss from RBCs within the analyzer, causing cell shrinkage (low MCV and high MCHC). Young animals: Puppies and kittens < 8-16 weeks old and calves and foals up to 1-2 months old can be microcytic and anemic. Calves and foals can remain microcytic (but not anemic) for up to 1 year of age. The reasons for this is unclear, but in young foals this is associated with low iron stores and has been partly attributed to a “physiologic iron deficiency”. Neonatal camelids can be anemic but did not have microcytic RBCs in one study (Fowler and Zinkl 1989). Breed associations: Microcytosis without anemia is found in Akitas, and possibly other Oriental dog breeds, such as the Shiba Inu and Sharpeis, and Siberian Huskies. An Italian study found that Abyssinian cats had lower MCVs than three other exotic breeds (Norwegian Forest, Siberian and Holy Birman) and previously established reference intervals for cats in that laboratory (Paltrinieri et al 2014). This suggests that breed-associated microcytosis may occur in cats as well as dogs. Iron deficiency: Iron is an essential component of many enzymes in cells and is also part of the heme group in hemoglobin (which consists of a porphyrin ring containing iron ). Much of the body’s iron stores are within red blood cells where iron is critical for hemoglobin synthesis. Iron deficiency could be due to inadequate intake or absorption of iron, excessive loss with external hemorrhage, or interference with iron metabolism. Lack or loss of iron: In adult animals, iron deficiency usually results from chronic external blood loss, often gastrointestinal in origin. Young animals are predisposed to iron deficiency due to low iron intake (in milk), low body iron stores, and rapid growth rate. Iron deficiency is thought to result in microcytosis by the following hypothesized mechanism: Erythrocyte division in the bone marrow is governed by the hemoglobin concentration. Cell division stops when a critical hemoglobin concentration has been reached. Therefore, if hemoglobin production is defective (as occurs in iron deficiency), erythrocytes continue to divide until that hemoglobin concentration is reached. With each division they become successively smaller. In camelids with anemia due to iron deficiency, a low MCV and MCHC is expected in the advanced stages, however early iron deficiency can manifest with just a low MCV and a normal MCHC (Morin et al 1992). Affected animals usually have some degree of hypochromasia in their RBCs on a blood smear, but this can be subtle and easily missed or in low numbers (not all) RBCs. Interference with iron use/uptake: Drugs, such as chloramphenicol and lead can interfere with iron uptake into hemoglobin. Nutritional deficiencies (or excesses) are an important cause of iron deficiency in animals, particularly herbivores. A deficiency of pyridoxine (vitamin B6) or copper can result in iron deficiency anemia. With pyridoxine deficiency in dogs, siderocytes can be seen in blood, indicating a “functional” iron deficiency (personal observations) Pyridoxine is required for heme synthesis in red blood cells, whereas copper is an essential component of ceruloplasmin and hephaestin which are required for the transfer of iron to/from macrophages and intestinal epithelial cells, respectively. An excess of some minerals, in particular zinc, can also inhibit copper absorption resulting in a secondary copper and then iron deficiency. We have seen a herd of musk ox with copper deficiency. Although they were microcytic, siderocytes were not seen in blood. Liver disease: Acquired or congenital hepatic shunts may produce microcytosis with or without anemia. The MCHC is usually normal but can be low. The microcytosis in shunting is thought to be due to altered iron metabolism from liver dysfunction and usually resolves with successful shunt closure. Unknown mechanisms or miscellaneous: An inherited dyserythropoietic disorder in English Springer Spaniels is associated with microcytic erythrocytes. It is possible that severe fragmentation anemias can result in microcytosis. We have seen a case of severe fragmentation in a 6 month old dog, which was concurrently microcytic, however the microcytosis may be due to other mechanisms involved with defective hemoglobin or red blood cell production (suspected congenital in this case due to the age of the dog). Note, that although spherocytes in immune-mediated hemolytic anemia (IMHA) appear smaller on blood films (because they have reduced diameter), they usually have normal volumes. Therefore, microcytosis is unusual with IMHA in dogs.